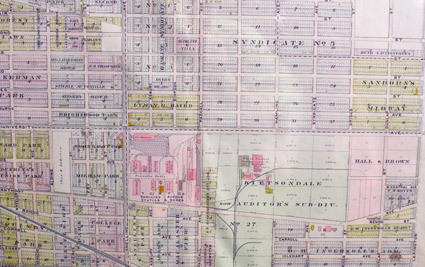 The following maps show the evolution of the University Avenue corridor from 1839 to 1949. Additional maps are available from Hamline History Corps. 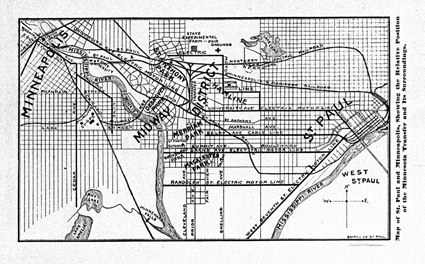 This map from 1914 shows the Snelling Ave. Streetcar Shops where the Twin City Rapid Transit Company manufactured and maintained its streetcars. To the east is the large parcel formerly occupied by the Kittson horse track and stables, which became the White Enamel Refrigerator Co. It would soon be joined by Brown & Bigelow (to the east) and Montgomery Ward (to the west). 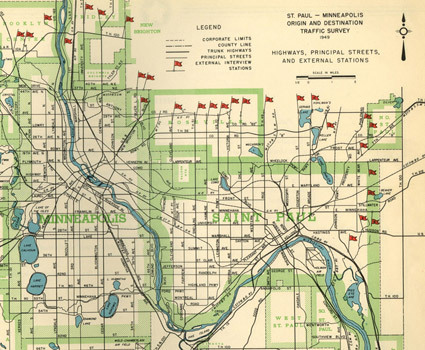 This traffic survey from 1949 was one of the maps used by transportation officials in planning a new freeway between St. Paul and Minneapolis. George Herrold, a former city planner, advocated a northern route for I-94 that would have roughly followed the Great Northern Railway right-of-way north of University Avenue. Courtesy Brian McMahon. 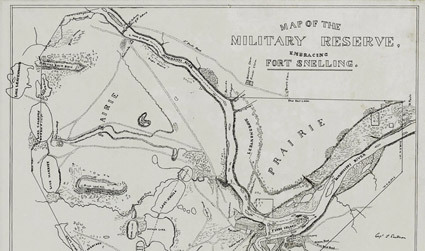 The 1839 Map of the Military Reserve shows “St. Paul’s Road” leading from the Falls of St. Anthony toward downtown St. Paul, approximately the same route that University Avenue would later occupy. Courtesy Hennepin County Surveyor. The major transcontinental railroads converged at the Minnesota Transfer yards at Prior and University in 1890. The map also shows the first electric streetcar lines in the Midway district. Courtesy Brian McMahon. 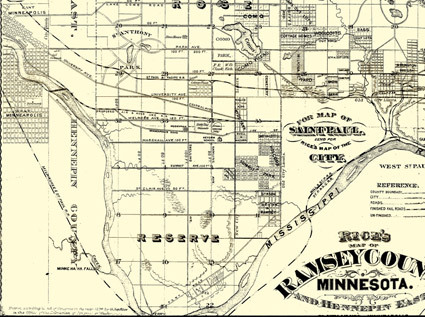 Rice’s 1874 Map of Ramsey County shows the original alignment of University Avenue when it ran along the southern edge of the Hamline University campus. It was later moved several blocks to the south to accommodate the Minnesota Transfer Railway. Courtesy Hamline History Corps. 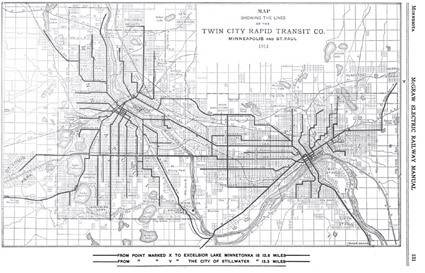 By 1914, the Twin City Rapid Transit Company streetcar system had been fully developed in Minneapolis and St. Paul. Its lines extended from Excelsior to Stillwater.